Around the works of Benjamin Britten in his centenary year, Alexander Platt, music director of Maverick Concerts, created a beautiful extensive program. Last Saturday night in Maverick’s unique Music Hall in the Woods outside Woodstock NY, the concert began with an exquisite harmonica improvisation on Britten’s Elegy for Solo Viola, with the wonders of circular breathing for that instrument brilliantly demonstrated by Chris Turner. Poetry and statements from Auden, Britten, Spender, Virginia Woolf and Isherwood, all relevant to the central theme of the celebration, were presented by readers Malcolm Ingram and Turner, intermixed with music of Britten, Purcell and Frank Bridge, Britten’s first teacher (at age 13). 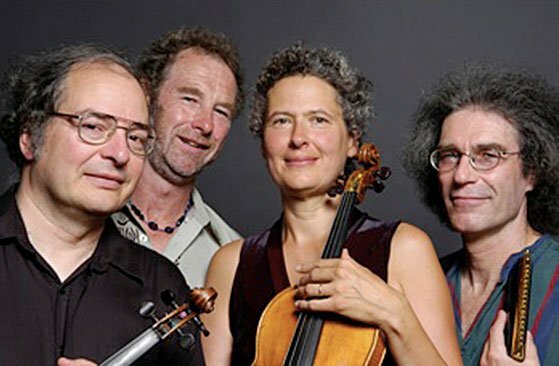 The Aurea Ensemble comprises Ingram and Turner with the string quartet of violinists Katherine Winterstein and Charles Sherba, violist Consuelo Sherba and cellist Emmanuel Feldman. They have the superb sound and precision expected of professionals but with the musicality that makes everything soar. Purcell’s Chacony in G Minor (arr. Britten), variations in chaconne form, is a piece that should replace that overperformed Albinoni Adagio, whose excessively romantic dead march string arrangement is okay once or twice only. Purcell’s variations are lyric, moving, tender and powerful, with the clarity that this early English composer (1659-1695) always brings. It is a new piece to me, and I will not let much time go by without hearing it again. Aurea also played a three-movement string quartet by Frank Bridge, made up of three Idylls, each performed separately with readings between. As Bridge and Britten were violists, their music offers considerable wonderful writing for the instrument, including solos within movements, and notably Britten’s Elegy for Solo Viola. After intermission came several more readings and another harmonica solo by Turner, showing that Larry Adler, the great classical-harmonica soloist of my youth, has been matched. The major piece was Britten’s Les Illuminations, Op 18, for high tenor and string orchestra, composed in Woodstock in 1939. Britten’s partner, Peter Pears, was the first to sing this demanding part, and Paul Appleby today was completely capable; several descending glissandos in these songs are no laughing matter to get right. Aurea was joined by the Maverick Chamber Players, conducted by Platt, with the viola, cellos, and basses particularly sensitive, not to malign the violins. Platt’s cues are wonderfully precise, in the manner of choral conductors, his earliest training. I extend even greater credit to him for taste: assembling this program of music and recitation was an enormously successful effort, with the intensity of performance reflected by audience response. I felt fortunate to have been present at this world-class event. Music of Britten and others continued on Sunday with the Escher String Quartet, violinists Adam Barnett-Hart and Aaron Boyd, violist Pierre Lapointe, and cellist Dane Johansen. Elgar’s String Quartet in E minor, from 1918, opened, and during its traversal I wondered what tonal devices make for interesting music, because I don’t get that from Elgar. He understands writing for strings, the requirements of bowing, range, tempo, variation, dynamics, clarity, texture, and I’m sure it looks good in the score, but it just doesn’t work. Britten’s Third Quartet, “Death in Venice,” from 1975 and written shortly before his death, is a different matter. The materials are clean and sing with spirit, the music grabs your attention, and although the score is complex, it’s easy listening, so to speak. The Escher Quartet played both pieces with gusto. Sir Harrison Birtwistle, born 1936, is a composer with contemporary techniques, but not the neoromantic sort. This stuff is a joy, organized sound for a new look at musical statements. Bernstein once said that the best dissonances were in Le Sacre, and although comparisons are just that, this quartet is not to be trifled with concerning modern sounds. Birtwistle’s quartet isn’t difficult to listen to, nowhere approaching the works of Webern and Schoenberg, and I recommend it to all. It’ll clear your sinuses. Beethoven’s last Quartet, No. 16 in F Major, the famous “Muss es sein? Es muss sein!,” would have closed the program, but Escher effectively reopened it. 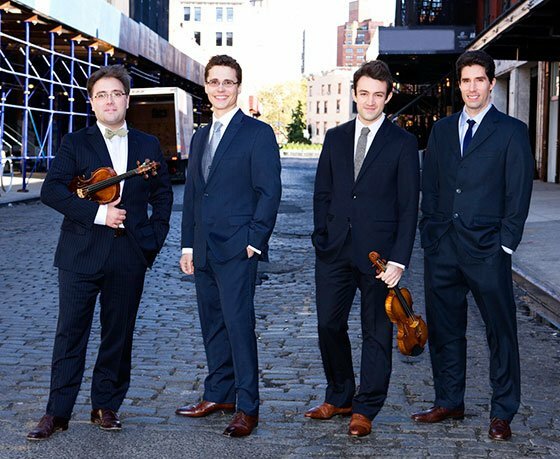 Their reading brought Beethoven into the 21st century, in a successful new view of the piece. Textures and lines and dynamics and tempo were refreshing without trying to sound “new.” Everything worked, and the audience loved it equally. Jay Wenk studied Composition at Juilliard on the GI Bill, for five years, learning was that he was a lousy composer, but his love for and interest in music have never diminished. Saturday’s event sounds wonderful, and I wish I could have been there. One correction, though: Les Illuminations was written for and premiered by soprano Sophie Wyss. When Pears began to sing the cycle himself, it quickly became “his”, but caused a bit of a rift between Britten and the soprano.